White-breasted Waterhen has dark slate-brown upperparts. Face and underparts are white. Flanks, vent and undertail feathers are rufous-chestnut. Bill is yellowish-green. In breeding plumage, we can see the red base on the upper mandible. Eyes are deep red. Legs and large feet are yellowish. 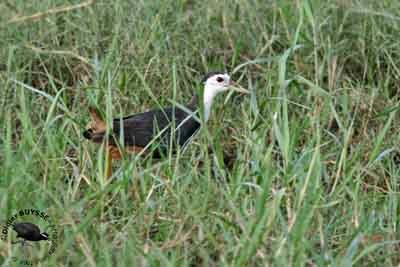 White-breasted Waterhen feeds mainly on insects, spiders, grain, fish, worms and snails, and some parts, shoots and roots, of marsh plants. White-breasted Waterhen is common and not threatened, although suffers from hunting, and it is often killed on the roads. Juvenile is duller than adults, with brown upperparts, and dark grey face and underparts. Bill is grey. 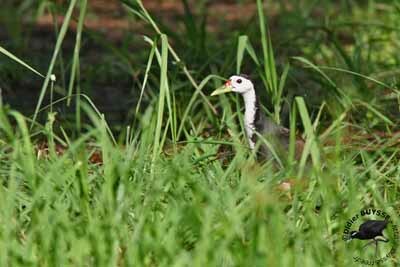 White-breasted Waterhen is very vocal in breeding season, and at dawn and dusk. It may also be vocal at night. It gives some grunts, soft hisses and other strange sounds, followed by a repeated raucous call “kwak-kwak-kwaak”. It also utters a soft, hollow “hoop”, repeated monotonously. Alarm call is a high-pitched “hik”. White-breasted Waterhen lives near freshwater marshes and in habitats with dense undergrowth. It is very common in mangroves, reedbeds, grasslands, ricefields, orchards, parks and gardens. It is also found near small streams and pools where there is dense vegetation. 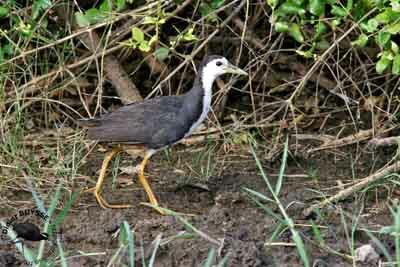 White-breasted Waterhen is resident in India, southern China, SW Asia to the Philippines and Bali. 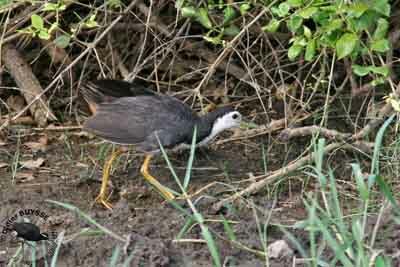 White-breasted Waterhen may be seen in open area in the morning, when it feeds. It picks up while walking, with tail held upright, and flicking it. It forages on the ground, feeding on worms and snails. It also eats roots and shoots of aquatic plants, and probes in mud or shallow water with its bill. It is also seen foraging above the ground, in bushes and small trees. It is clumsy among branches, due to its enormous feet with long toes. However, its slender body allows it to slip through the dense vegetation. White-breasted Waterhen can step on large lotus leaves, and sometimes it has to swim, but it is not a very good swimmer. It can be seen foraging singly or in pairs, and it is active by day. It roosts at night in vegetation, in bushes or trees. If alarmed, it will fly or run into dense vegetation, dashing in with head down. White-breasted Waterhen northern birds may migrate southwards, forming mixed flocks with local residents. Northern birds seem to be larger than others. White-breasted Waterhen flies with dangling legs and outstretched neck, as other rallidae. It flies when necessary, usually gliding along at slow speed for a few metres, before rapidly landing, because their huge, heavy feet. White-breasted Waterhen breeds all year round, but mainly during rains. Its nest is a shallow cup made with twigs, stems or leaves. It may also build it with woven tall grass stems, with thin lining of grass or other plant material. Sometimes, we can see a kind of roof, made with surrounding plants. 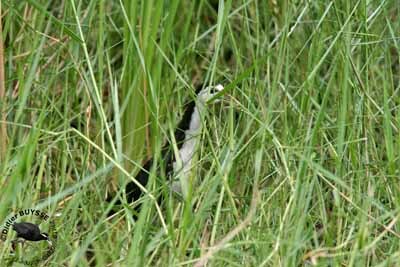 Nest is built among reeds, tussocks or dense vegetation, in wet or dry areas. It is at about one to two metres above the ground. It also may be situated on the ground, but near water. Female lays 4 to 9 brownish-white or grey eggs, spotted and marked with reddish-brown. Incubation lasts about 20 days, shared by both adults. Chicks are covered with black fluffy down. They leave the nest very soon, and they run alongside their parents which care for them. This species may produce three broods per year.